near ski resort Klosters / Davos. Suitable for 6 adults and 2 children. Detached very spacious chalet in Küblis, canton Graubunden, near the ski area Klosters / Davos. Suitable for 6 adults and 2 children. On the upper floor is the living area with living room with beautiful views around, the kitchen, bathroom, children's bedroom and master bedroom. On the ground floor there are two very spacious bedrooms and a second bathroom and toilet. The large garden offers many opportunities to relax. The holiday home was built in 1975 and modernized in style and preserving original details. 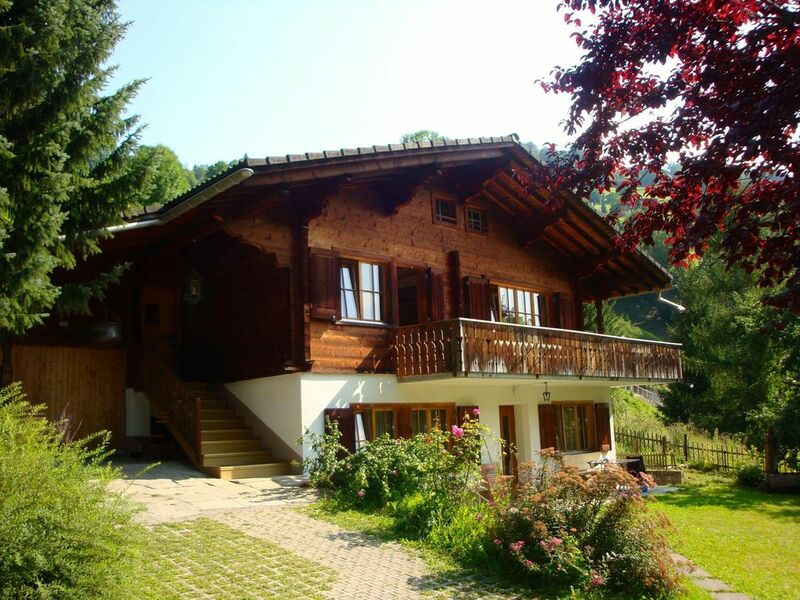 The house is located in the beautiful Prattigau hiking area near the ski area Klosters / Davos and can accommodate 6 adults and 2 children. On the upper floor is the living area with a beautiful living room with all comfort and beautiful views all around, a separate kitchen, bathroom, children's bedroom with bunk beds and master bedroom with spacious double bed (separate mattresses) and beautiful views of the Silvretta massif. On the ground floor there are two very spacious bedrooms with double beds (separate mattresses), a second bathroom and toilet and laundry room with washing machine, dryer, freezer and ice machine. The whole house has been furnished and furnished with the utmost care. The kitchen is fully equipped including dishwasher, refrigerator, microwave and Nespresso machine and beautiful Bunzlau Castle dishes. The holiday home is situated in a quiet area about 50 meters above the village of Kublis on a sunny southern slope at 850 m altitude. It is 10 minutes walk to the center of the village and the (ski) bus stop and 15 minutes to the station. The garden and orchard (1000m2) offers many possibilities to relax, play and bbq (gas bbq present). The large south-facing balcony gives a wonderful view of the village below and the Silvretta massif. In the summer you will find direct connection from the house to various hiking trails including a climb to the 'Prättigauer Höhenweg' from Klosters to St. Antönien one of the most beautiful hiking areas between Prättigau and Montafon. In the winter, about 500 meters from the house, the longest alpine run of Graubunden ends the Parsenabfahrt of the ski area Klosters / Davos. By car you drive in a quarter of an hour to the parking lot of the Gotschna cabin lift in Klosters. The chalet can only be rented per week *. Rent includes bed linen and final cleaning. Tourist tax: CHF 4.50 / Person (from 12 years) per night. * rental price may differ in certain periods. Different rental periods in consultation. When renting several weeks discount 10% or more on the rent. Due to reclassification various addresses have been adapted in the municipality of Küblis. Schönes, geräumiges Chalet, das gut in Schuss gehalten wird. Gute familientaugliche Raumaufteilung. Küche mit sehr umfangreicher guter Ausstattung. Gut gelegen für diverse Unternehmungen in der Region, man kann direkt vom Haus aus loswandern.